Colistimethate sodium is a cyclic polypeptide antibiotic derived from Bacillus polymyxa var. colistinus and belongs to the polymyxin group. The polymyxin antibiotics are cationic surface-active agents that work by damaging the cell membrane. The resulting physiological effects are lethal to the bacterium. Polymyxins are selective for Gramnegative bacteria that have a hydrophobic outer membrane. *In vitro results may not correlate with clinical responses in the case of Acinetobacter species. When necessary, expert advice should be sought when the local prevalence of resistance is such that the utility of the agent in at least some types of infections is questionable. Cross-resistance between colistimethate sodium and polymyxin B would be expected. Since the mechanism of action of the polymyxins is different from that of other antibiotics, resistance to colistin and polymyxin by the above mechanism alone would not be expected to result in resistance to other drug classes. 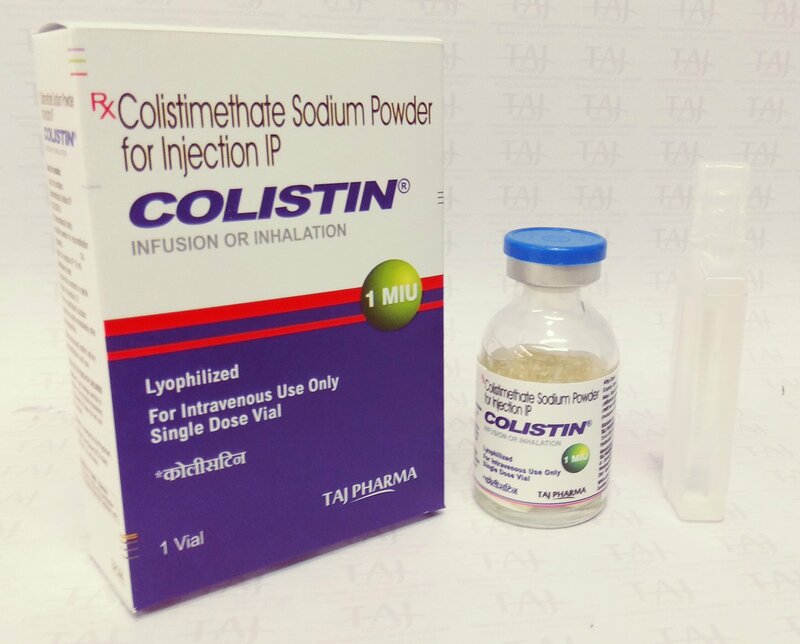 Colistin can be given as a 50 mL intravenous infusion over a period of 30 minutes. Patients with a totally implantable venous access device (TIVAD) in place may tolerate a bolus injection of up to 2 million units in 10 mL given over a minimum of 5 minutes (see Reconstitution for Parenetral Administration). The dose is determined by the severity and type of infection and the age, weight and renal function of the patient. Should clinical or bacteriological response be slow the dose may be increased as indicated by the patient’s condition. A minimum of 5 days treatment is generally recommended. For the treatment of respiratory exacerbations in cystic fibrosis patients, treatment should be continued for up to 12 days. Colistin is contraindicated in patients with known hypersensitivity to colistimethate sodium (colistin) or to polymyxin B and in patients with myasthenia gravis. Use with extreme caution in patients with porphyria. Nephrotoxicity or neurotoxicity may occur if the recommended parenteral dose isexceeded. Use with caution in renal impairment (see DOSAGE AND METHOD OF ADMINISTRATION) as colistimethate sodium is renally excreted. It is advisable to assess baseline renal function and to monitor during treatment. Serum colistimethate sodium concentrations should be monitored. Bronchospasm may occur on inhalation of antibiotics. This may be prevented or treated with appropriate use of beta2-agonists. If troublesome, treatment should be withdrawn. Concomitant use of colistimethate sodium with other medicinal products of neurotoxic and/or nephrotoxic potential should be avoided. These include the aminoglycoside antibiotics such as gentamicin, amikacin, netilmicin and tobramycin. There may be an increased risk of nephrotoxicity if given concomitantly with cephalosporin antibiotics. Neuromuscular blocking drugs and ether should be used with extreme caution in patients receiving colistimethate sodium. Renal Impairment Use with caution in renal impairment as colistimethate sodium is renally excreted and please refer under DOSAGE AND METHOD OF ADMINISTRATION. There are no adequate data on the use of colistimethate sodium in pregnant women. Single dose studies in human pregnancy show that colistimethate sodium crosses the placental barrier and hence should be used during pregnancy only if the potential benefit justifies the potential risk to the foetus. Colistimethate sodium is secreted in breast milk. Colistimethate sodium should be administered to breastfeeding women only when clearly needed. taken in dose selection and it may be useful to monitor renal function. condition of the patient. In cystic fibrosis patients, neurological events have been reported in up to 27% of patients. These are generally mild and resolve during or shortly after treatment. Neurotoxicity may be associated with overdose, failure to reduce the dose in patients with renal insufficiency and concomitant use of either neuromuscular blocking drugs or other drugs with similar neurological effects. Reducing the dose may alleviate symptoms. Effects may include apnoea, transient sensory disturbances (such as facial paraesthesia and vertigo) and, rarely, vasomotor instability, slurred speech, visual disturbances, confusion, or psychosis. Adverse effects on renal function have been reported, usually following use of higher than recommended doses in patients with normal renal function, or failure to reduce the dosage in patients with renal impairment, or during concomitant use of other nephrotoxic drugs. The effects are usually reversible on discontinuation of therapy. In cystic fibrosis patients treated within the recommended dosage limits, nephrotoxicity appears to be rare (less than 1%). In seriously ill, hospitalized, non-cystic fibrosis patients, signs of nephrotoxicity have been reported in approximately 20% of patients. Hypersensitivity reactions, including skin rash and drug fever, have been reported. If these occur, treatment should be withdrawn. Local irritation at the site of injection may occur. Inhalation may induce coughing or bronchospasm. Sore throat or mouth has been reported and may be due to Candida albicans infection or hypersensitivity. Skin rash may also indicate hypersensitivity; if this occurs, treatment should be withdrawn. Overdose can result in neuromuscular blockade that can lead to muscular weakness, apnoea, and possible respiratory arrest. Overdose can also cause acute renal failure characterized by decreased urine output and increased serum concentrations of BUN and creatinine. There is no specific antidote, so overdose should be managed by supportive treatment. Measures to increase the rate of elimination of colistin, e.g., mannitol diuresis, prolonged haemodialysis or peritoneal dialysis may be tried, but effectiveness is unknown. sodium should be avoided. The addition of other antibiotics such as erythromycin, tetracycline, and cephalothin to solutions of Colistin may lead to precipitation. Do not store above 25°C. Keep the vials in the outer carton. Chemical and physical in-use stability for 28 days at 4oC has been demonstrated. From a microbiological point of view, solutions should be used immediately. If not used immediately in-use storage times and conditions prior to use are the responsibility of the user. They would normally be no longer than 24 hours at 2 to 8°C, unless reconstituted and diluted under controlled and validated aseptic conditions. Solutions for nebulization have similar in-use stability and should be treated as above. Patients self-treating with nebulized antibiotic should be advised to use solutions immediately after preparation. If this is not possible, solutions should not be stored for longer than 24hrs in a refrigerator.